India’s Mahatma Gandhi perhaps said it best when he said, “Earth provides enough to satisfy every man's needs, but not every man's greed.” Indeed, humans haven’t been the kindest to the environment so let’s do everything we can to protect it. Our company offsets emissions from all corporate flights and our marine vessel, and we encourage our travelers to do so by providing an online platform through Sustainable Travel International. Your tour leader will also provide you with information about local environmental issues in their respective regions, and provide suggestions of how we can best protect the local environment and culture. 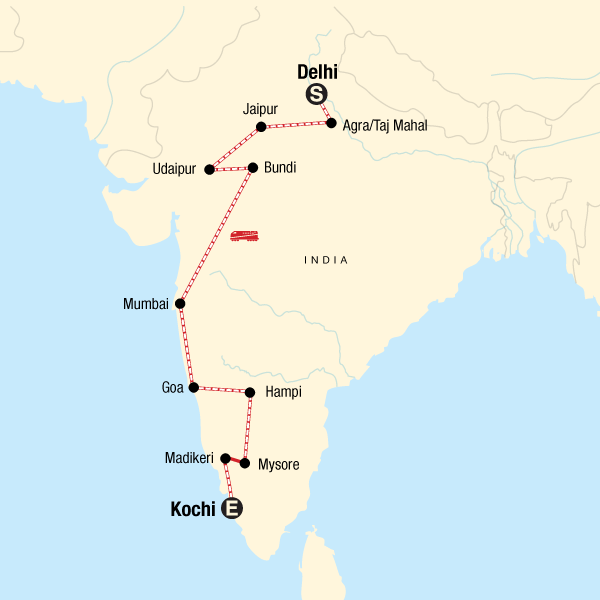 Low Impact Transportation: This trip gives you the chance to master India’s train system from sitting in a seat, to overnighting in a sleeper car. Local transportation allows you to experience the culture on a deeper level! Supporting the community and putting money into the Indian economy is a great way to do so. Perhaps in Udaipur you might choose to take a cooking class, or upon arrival in Delhi you might want to book your airport arrival transfer with us? All of our airport arrival transfers in Delhi support our Planeterra, Women on Wheels project, an airport transfer service driven by women who were previously marginalized, underserved, and underprivileged. It’s a fantastic way to begin your trip! World Heritage Sites are also great travel accomplishments and a way to support the community. On this trip add in many such as the Agra Fort, Taj Mahal, Jantar Mantar in Jaipur, Mumbai’s Chhatrapati Shivaji Terminus (historic train station) and Elephanta Caves, the Churches and Convents of Goa. Sail past the Western Ghats while on the Nilgiri Mountain Railways.